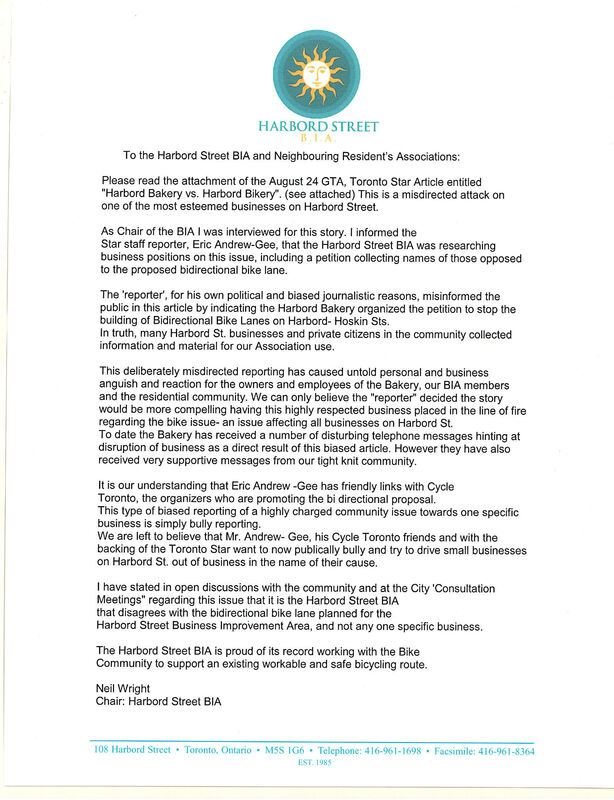 Two-wheeled troubles on Harbord brewing? 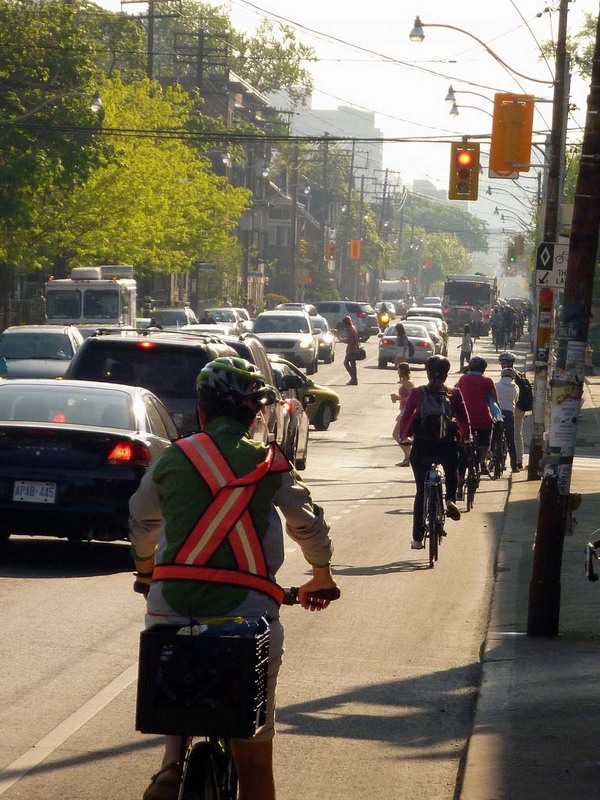 A separated bike lane is coming to Harbord next year. It is implicitly intoned to be a Montreal-style, bi-directional lane on the north side of the street. That is all. Nothing more to see here, move along. It usually takes a long time to get anything done at City Hall so it seems odd that such a grandiose and new-to-Toronto type of bike lane proposal would go through to council with much less rigour. In the case of the new Harbord bi-directional bike lane, we’re told the design suggestion is a result of community consensus and political will. Yet there have been no design proposals or even vague plans from the city for alternative options, such as a uni-directional bike lane – just a few photos in a presentation to the public of the recently installed cycle track on Sherbourne, which is meant to be part of this network of separated bike lanes we keep hearing about. 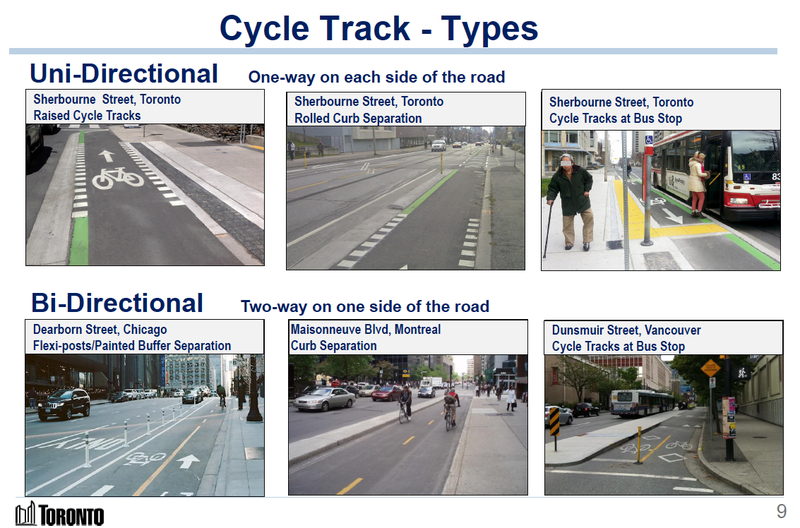 These slides were from the public meeting in July to present the idea of the bi-directional bike lane option to the public. But to get things done – especially at City Hall – you need to have a plan, preferably a big plan. Denzil Minnan-Wong, chair of the public works and infrastructure committee, assures us that separated bike lanes are the way to go, and that more will be coming to Richmond and Adelaide next spring. Though Councillor Adam Vaughan cautions against what seems like pro-bike lip service and pandering rhetoric from right-leaning councillors who traditionally oppose expanding cycling infrastructure too far into car territory. 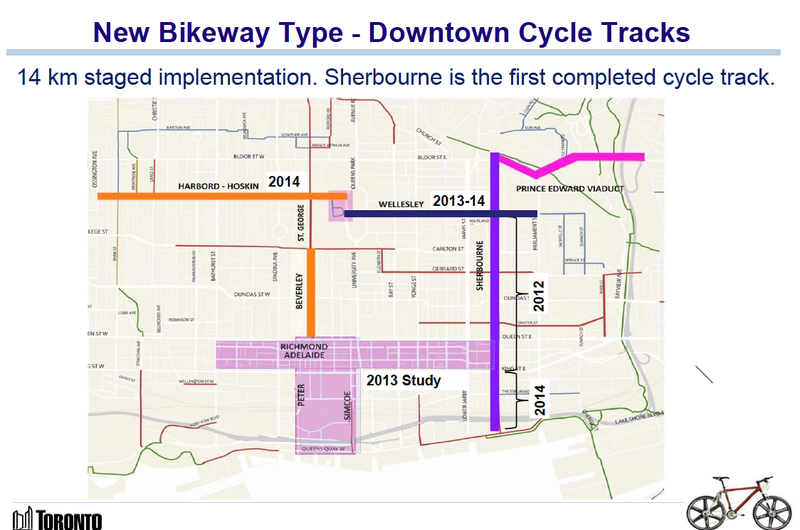 However, while new lanes have been approved by council, implementation is delayed due to the construction of what Vaughan called "luxury lanes" like that proposed for Harbord – lanes which are great for improving safety, but do little to improve connectivity and build the network. Still, if Harbord is to become a separated bike lane, Vaughan will tell you: it’s bi-directional or nothing. Some would say a perfectly safe, functional bike lane already exists on Harbord between Ossington and Bathurst. And that the problem with Harbord is between Borden and Spadina, in the heart of “Harbord Village” where the bike lane ends, and is replaced by on-street parking and sharrows. “The bi-directional protects the parking that is needed,” says Vaughan. When asked for specific numbers his assistant helps out: “Right now there are 48 parkings spots – and with the bi-directional plan, we are trying to salvage 95 to 98 per cent of parking.” The unidirectional plan would take out all of the on-street parking. “If the choice is bi-directional or nothing then bi-directional is safer,” says Vaughan. Yet according to technical guidelines outlined in Velo Quebec's handbook for Planning and Design for Pedestrians and Cyclists, bi-directional lanes are inadvisable where there are too many cross streets, hidden lanes or alleyways and intersections, because of the interference caused by crossing and turning traffic. The stretch of Harbord between Ossington and Spadina has 23 intersecting streets (not to mention the over 20 laneways), making it less than ideal. Basically, Vaughan explains, that if we have uni-directional bike lanes with wholesale businesses like the bakery on the street, there would be no way to stop the delivery vehicles from blocking that lane while doing their pick up and drop offs – it would disrupt the bike lane and disrupt parking. “The safest and most politically attainable option is the bi-directional lane,” he says, reiterating earlier comments. Councillor Mike Layton's ward encompasses the west portion of the Harbord bike lane. Layton, a lifelong cyclist, says, "One of the biggest things we are going to accomplish with the separated lane network is the increase in the number of cyclists. If we build the network we are going to get more people on bikes." Vaughan admits there are many design issues that will need creative solutions, like dealing with transit stops and pedestrian crossings. “We’re going to do this really smart – we’re going to create a consensus where people know what the trade offs are and know what the expectations are and everyone is going to have to give up a little to get something better.” says Vaughan. Although there appears to be a loss of consensus – the BIA no longer seems to be on board with the bi-directional plan. In the end it seems that on-street parking from Spadina to Borden is the ultimate concern for the entire design of Harbord street, from Queen’s Park to Ossington Avenue. Presumably the obsession with parking is due to the fear that there will be loss of business, yet we now have numerous studies from all over the world, including research conducted right here in Toronto, that show cycling and cyclists are a great boon to the local economy. According to this Bells on Bloor video the Bloor-Annex BIAs and residence associations are chomping at the bit to get some bike lanes. To quote Wade McCallum, Chair of the Bloor-Annex business owners association from the video: “We are, as a board, pro-bike lanes. We've had many conversations over the last several years…and we have made an official stance: We want bike lanes on Bloor,” he said noting successful public consultations. Tell that to the Harbord Village BIA. It’s somewhat helpful to have this post thanks, especially the reference to the Velo-Quebec design standards which have a 300M suggested distance between intersections; the Harbord blocks tend to be c. 75M apart. The Danish simply say don’t do bidirectional “through cities” because of the safety issues. 16 years ago a proposal from a Bloor Annex business owner was to take a curb lane and do a bi-directional lane along Bloor but it was deflected by city staff on the conflict points of the short blocks, and have these blocks changed? It’s really really disappointing that somehow this has surged ahead when Harbord is clearly not so dangerous compared with the rest of the west end, not merely Bloor, and it feels far more like a way of luring people into a false sense of the Fordists supporting biking by rebuilding at great expense an OK but existing lane, though there clearly needs to be a good link to Wellesley, and bi-directional is the solution for that small bit at Queen’s Park. There’s also a strong sense that this is meant to sabotage pushes for Bloor bike safety including the part that is now being repaved west of Bathurst with ZERO change for cycling safety. And I’ve heard that the inspiration for Annex thinking about Bloor has been based on what might be occurring on Church St. – but that’s about 1.5m wider than Bloor, so the devil’s in the details, and while I think the Annex BIA people and local RAs really do want to improve bike safety, there’s been a lot of talk and the road rots and people are getting hurt still. The solution – though I support bike lanes here etc. but I just don’t trust the politricks – is to pilot the removal of parking all along the narrow 4kms of Bloor St. W. to start off with wider curb lanes and a lot of inferior sharrows, but gives us the width, and save the bi-directional for really challenging roads like King or Queen. As someone who uses these lanes quite often, I think this is actually a much better idea. I think it is likely that separated bike lanes would become unusable in the winter and be clogged by the sheer number of cyclists who use Harbord. The new plan seems to address one of the biggest problems with Toronto’s bike lanes: they are usually located immediately next to parked cars with no buffer, such as on College and much of Davenport. This is the most dangerous part of the road you could possibly ride in and yet the city is encouraging people to cycle there. Not only are you vulnerable to being doored, but it’s also the last place cars turning from side-streets will see you. As it stands, the volume of cyclists on Harbord during rush hour is huge and I would much rather have more space than be segregated in two tiny lanes. It would make sense to drop the speed limit to 30km/h for cars, install a number of traffic calming measures and have an actual bike lane between Spadina and Bathurst. I would much rather see a proper cycle track on Bloor.